The hotel has 55 rooms, some of which have a sea view or a view over our perfectly maintained garden. 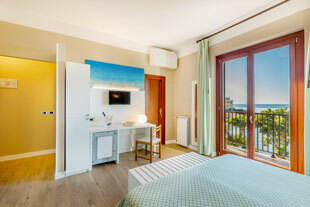 The rooms feature every imaginable comfort to make your stay as enjoyable as possible. In particular, the padded sommier beds, soundproofing and "sun cool" windows in every room assure a great night's sleep, peace and quiet and privacy.